Today’s review focuses on a niche in the golf industry: customization. In this case, custom club covers. That’s right, I said custom golf club covers. 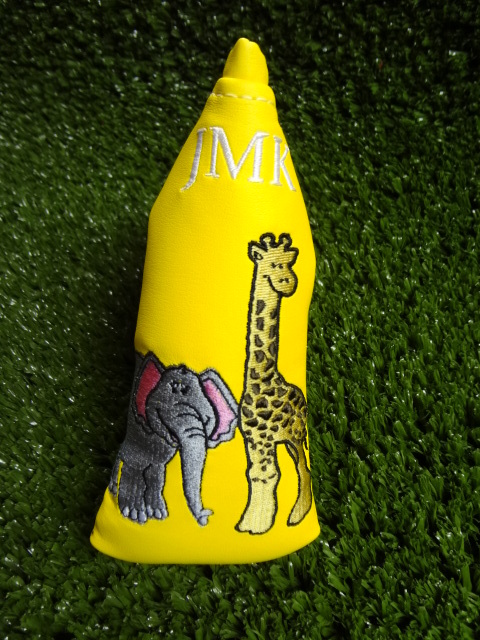 Although it sounds over the top, many golfers like to customize their bag. Your clubs should fit you like a glove–lofts, lies, grips, shafts, and more. Customizing the appearance of your clubs is an extra step many golfers take to stand out and to put their own personal stamps on the game they love. For example, looking at LG’s bag, he even has his own custom ferrules (see https://thepowerfade.wordpress.com/2011/07/01/whats-in-the-bag-lg-edition/ for LG’s custom blue ferrules, seen best on the photo of his wedges). And, would Tiger really have been as great without his notable friend, Frank? Personally, I haven’t ever believed that I had a good enough game to customize my own bag–and, quite frankly, I didn’t have a good enough bank account. However, this year, I’ve settled into my equipment, and, as a Christmas gift to myself, I decided it was time to customize my golf bag. Having just had my second child, a custom club cover dedicated to my two children was what I wanted. The first thing I needed to do was find someone who could make it. For that, I can tell you–look no further than DelilaH at GirlyGolfer (http://www.girlygolfer.com/CLUB%20COVERS%20MEN.html). I emailed the contact information on the website stating I had an idea and wanted to make a cover dedicated to my children. Delila responded in no less than a week–starting with an apology for how long it had taken to get back to me! Delila (the H is for her last name) contacted me asking whether I had a specific idea, which I did not. I pointed out a few things I thought would be important for a personal cover: (a) I wanted yellow to match my bag, which is generally yellow in honor of my alma mater, Georgia Tech; and (b) I wanted an elephant and a giraffe somewhere on the cover because those animals signify my two children. Maybe I would add my initials, but it wasn’t required. Within two days, Delila was back to me with three different design options with various pricing. After about a day of deliberation, I picked one of the options and offered a few tweaks. She boxed it for shipping that night, and I had it two days later. Soup to nuts, from the “hey, I think I’ll get a custom club cover” to having the finished product in my hand it took Delila 10 days, and she was apologetic that it took as long as it did! All of my reviews have a drawbacks section to highlight at least one thing I did not like about the process, the course, the application, whatever. The only thing I can say was a drawback was cost. As with any customization, the cost will not be a bargain. The custom cover shown above was $70 shipped ($64 for the cover + $6 shipping). However, Delila did an excellent job conceiving the design, making it, and putting it together, and it is an extremely high quality cover. I cannot complain about $70 for all of that work that she did. Some of the seams are not 100% straight and aligned, but I expected some variation as the covers are sewn, not mass-produced, and the small “imperfections” that might bother some purchasers give it the custom-made look that I prefer. Altogether, I got EXACTLY what I wanted: a custom-made cover that is exactly my style and is the perfect accent to my golf bag (look for it in my upcoming What’s In The Bag post). The process was unbelievable, quick, and I could not envision it running any smoother than it did. Thanks, Delila!